You are about to be swept into the genius minds of New York Mets Fans, aw-struck by their farsighted scheming, stricken dumb by their wonderful stories as they lay bare their sordid love affair with the Mets. There has never been a book like this... a vehicle for fans to share theirr funniest stories, saddest memories, happiest times, and craziest moments. Almost every story is reflection of your personal Mets memory bank! Remember your first trip to Shea Stadium? 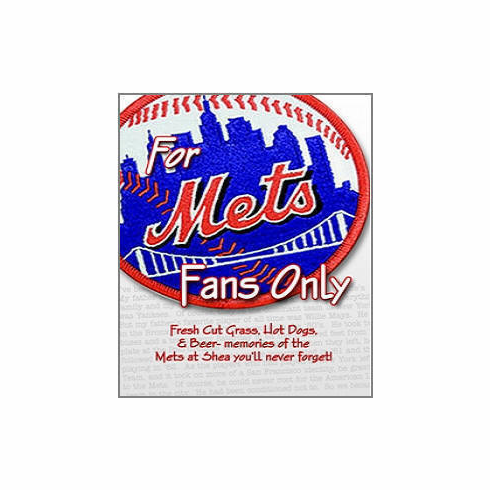 Remember your first Mets game? Remember the first time you listed to them on the radio on a hot summer night? The joy, the jokes, the pranks, the games, the memories....told by an all-star team of FANS. It's like sitting around the ballpark listening to friends reminiscing about the team we all love. Rich Wolfe is the number-one selling sports book author in America the last six years. He captained the winning team in the National Team Sports Trivia Championship last year in St. Louis, MO. Get your estate in order, you may not see another dawn...because you might die laughing from reading For Mets Fans Only. Hardcover, 6.25" x 9.25", 255 pages.